Preparations are underway for what is billed as Belize’s preeminent Maya celebration of the Winter Solstice of 2012 with the procurement of a large stone on which a commemorative monument will be inscribed to carry on an ancient Maya tradition, Chaa Creek owner Lucy Fleming said today. 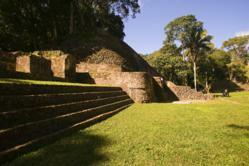 Caracol is the largest known Maya site in Belize and one of the biggest in the Maya world. The Maya, one of the world’s first literate people, created vast libraries and archives during the millennia-long span of their civilisation, most of which were destroyed by Spanish conquistadors in their zeal to remove “pagan” elements from their empire. Stone monuments known as stelae erected in cities and around temples were impervious enough to survive and have provided important clues from which historians have pieced together a picture of ancient Maya civilisation. Now, in what Ms Fleming said is a respectful acknowledgement of the Maya civilisation, The Lodge at Chaa Creek is having Maya artisans carve a 2012 Winter Solstice stela using traditional tools and methods. The inscriptions will use Maya glyphs, the hieroglyph symbols used by the Maya. Ms Fleming said a Maya family has been contacted and is currently finding a suitable stone. The meticulous carving will then begin so that the finished stela will be in place for a dedication to take place just before the huge December 21 celebrations. While there will be celebrations nationwide, Chaa Creek will be hosting observances within its own 365 acre nature reserve, with a candlelit procession from the Lodge to Tunichilen, an ancient temple located on the property. “Given the importance of December 21 2012, we want to do something rather grand, but at the same time respectful. Chaa Creek sits directly within the Heartland of the Maya and a large proportion of our staff is of Maya descent. We’ve been hosting legitimate Maya research for years, so it is very important to us that the culmination of the 13th Bak’tun of the Maya Long Count is celebrated at Chaa Creek with the reverence and enthusiasm it deserves." Ms Fleming said the weeks leading up to the 21 December Winter Solstice at Chaa Creek will feature Maya lectures and presentations as well as the construction of an authentic Maya village where guests can learn about Maya culture with hands-on workshops including arts and crafts, weaving, roof thatching, cooking and the preparation of Xocoatl, the Maya hot cacao drink from which all chocolate developed, as well as Maya medicinal plants, healing and other topics prior to the December 21st procession and stela dedication ceremonies. “In the back of our minds there’s this tongue-in-cheek picture of future archaeologists discovering the overgrown remains of Chaa Creek, which they may construe to be a village or ceremonial site, and stumbling across our own stela as a major archaeological find,” she said. For more information about The Lodge at Chaa Creek, toll free USA 877-709-8708, UK 0-207-096-0329, Belize 501-824-2037 reservations(at)chaacreek(dpt)com or visit the web site at http://www.chaacreek.com.